Back in October, VAIO was mentioned as one of the several Japanese companies that were going to collaborate with Microsoft in order to make and release Windows 10 smartphones. Today, VAIO finally unveiled its first Windows 10 handset, which is weirdly called Phone Biz. Announced in Japan, the VAIO Phone Biz is a metal-made device that should be available to buy unlocked, starting April, for around $430. The VAIO Phone Biz offers decent specs, but it's not a high-end smartphone (like Microsoft's Lumia 950 and Lumia 950 XL). The handset sports a 5.5-inch display with 1080 x 1920 pixels, and is powered by a mid-range octa-core Snapdragon 617 processor. There's 3 GB of RAM on board, plus 16 GB of storage space, and microSD card support. A 13 MP rear camera, a 5 MP front-facing camera, and a 2800 mAh battery are also included. Thanks to Windows 10, the Phone Biz comes with features like Cortana and Windows Continuum. Just like VAIO's first smartphone (released in 2015 with Android on board), the VAIO Phone Biz will most likely not be available outside Japan. But we'll let you know if things change in this regard. VAIO is a name that people usually associate with Sony, and with premium laptops. However, as of 2014, VAIO is no longer a Sony brand: it was sold to a Japanese investment firm, though Sony still retains a 5% stake in the company. Besides smartphones, the new VAIO continues to make and sell laptops, currently only in the US, Japan, and Brazil. Sony or aio is not what it used to be.. IN 2007/08 they had great design even laltops they gone uglier and uglier since 2013..? Looks like a professional gadget. I have used a VAIO laptop, and I have to say that, I was impressed with its build. The original Vaio Z has to be the best laptop this decade. An 'ultrabook' in 2011, yet it was a full quadcore i7, had a 'lighting port' before Apple hijacked it and blocked other OEM and the drop dead beautiful magnesium body. :-) Thesedays, I feel that whoever talks about bezels, is just a person who knows nothing about usability, long term performance and quality. I would like to refer them as "Bezel Trollers"
I like my phones to have smaller bezels to, and it has not affect me in anyway of how I use my phone. But hey I guess I'm a bezel troller to because I prefer phones with smaller foot print? On the flip side, bezels also don't affect the way anyone uses phones. So why even bother commenting on bezels? Simple, if you have absolutely no interest in buying the phone, no interest in constructive discussion and simply dump a hit 'n run 'OMGz HUGE BEZEL' type comment, you are a troll. It's easy to identify which comments are genuinely interested in the technology and those that are there to spread bigotry. Wow. Saying a phone has huge bezels is BIGOTRY now. And anyone who doesn't share your opinion is a bigot. Plus, you wouldn't want to hurt the phone's feelings. I hate the political correctness being jammed down everyone's throats lately and you're now spreading it to opinions on gadgets. Now, in regards to the bezels, I also think that they are huge. You do need some bezel to make a phone comfortable to hold, but humongous ones are not needed to get to that point. Plus, the phone design is not just about holding it but also about how it fits in your pocket, and they could've made this much more pocketable by decreasing those top and bottom bezels. I think most Windows smart phones built by MS OEM's will have "Continuum" because thet know it is a good feature to have available to their customers. this MS win10 Continuum capable smart phone is at least cheaper than any MS 950 or 950XL. 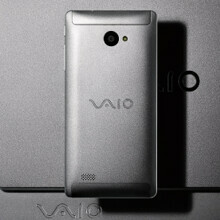 the question is will Vaio make an American version to sell to on any American carrier ? Since Android doesn't make OEMs any money, making an iOS-based phone would probably be a bad legal idea for VAIO, and Palm and other OSes have decreased in popularity, I'd say this seems like a good idea. Windows smart phones do not have popularity in the USA and China however in some countries they have at least 10 percent of the market share. I am sure that Microsoft sells enough of them on a world wide basis to continue to make them even though at home they do not sell well. Am I the only one who thinks it looks a lot like the HTC One M7?